The coming of twilight blows out the metal chirping of the cicadas, leaving the dominion of the valley to the wind. Edirne, Eastern Thrace, ancient Adrianople. It is my last sunset in Turkey. I observe the night taking turns with the day sitting at a rest stop on the E80 state road, which makes its way in Bulgarian land in less than a kilometer. To the West, the continuous line of leaves behind which the sun falls reveals a bend of the Evros River. Greece, Turkey and Bulgaria all at one glance. A driver slows down. There is nothing around here that could attract a passer-by. He has white hair and wrinkles on his forehead. The man gets out of the car. Turkish music echoes from the radio. Without saying a word, he comes closer. I do not realize it until he is close enough for me to read his gaze: in that precise moment, in his eyes I see the same undefined look I had been given by the merchants of Izmir who had mistaken me for a migrant. Pointing the finger at me, he utters words that dispel all doubts: “Afghanistan ? Pakistan? ”. I remain still, appalled. The man makes an effort to communicate, but he only speaks Turkish. Nervously, he keeps repeating “Jandarma, Jandarma” pointing at the river. I pretend not to understand, so he shouts louder: “Jandarma! ”. Then, suddenly, with his index finger he mimes an imaginary gun. He points it at my head: “Jandarma, boom! ”. Evros, Maritsa, Meriç. A trinomial typical of a border area. The bed of the river crossing this valley is run by blood as well. “The river returns bodies, every once in a while. This year only, confirmed victims have been 38. The police just shoots pictures of the bodies and buries them. Migrants do not carry documents with them, so it is practically impossible to establish their identities”. Downtown Edirne, Saturday morning. Baklava , a crunchy pastry made of chopped pistachio and molasses, is being served in front of the caravanserai in the small square. I eat a slice with a local doctor, who prefers not to disclose his identity. He has been a voluntary and dealt with migrant issues for years, offering them free treatment and assistance of various kind. “Over just one year, migratory pressure in this region has grown exponentially”. His words confirm the figures provided by the UN Refugee Agency: during the first semester of 2010, the flow increased by almost 400%. The doctor goes into the details of his job: “Sometimes I can see signs of violence, especially dog bites. It is not hard to imagine their causes: the Bulgarian border police uses dogs to patrol the border”. I discover that some of the migrants, frightened by the river or unable to buy a place on the boats managed by the kaçakçılars , continue their journey towards Europe through Bulgaria. Or at least, they try. “In order not to get lost, they follow the high tension wires North-bound. Some of them have already done it 10 or 15 times. Chances of success, though, are very low. They are almost always rejected. And the border police certainly does not mince matters”. I tell him about the “episode” from the day before, at the rest stop. “Yes”, he confirms, “our Jandarma is not one to kid, either. I think that driver mistook you for one of the dozens of migrants that wait till it gets dark to cross the river. He just wanted to warn you”. We get in the car. Just a short drive and we are at an unused military facility, not far from the river. On the fence, a writing stands out: “Il Eniyet Mudurlugu geri gonderme Merkezi ”. “This is the detention and expulsion center that is closest to the Evros and, in its own way, it is a huge puzzle”, the doctor explains while we observe the sheds lined under the sun. From the small windows, cloths are hanging out to dry. It is the same image I saw two days ago in Kumkapi, the detention center in Istanbul. Inside those sheds, tens of migrants atone for sins bigger than them, paying for mistakes that often they have not made. For some of them, repatriation or expulsion are imminent. The doctor continues: “The problem is, this year the center is almost empty. There are only 45 people, while the average is over 200. Given the increase in the migrant flow, the center should be overcrowded”. In the early afternoon, I go to the police station just out of the city, where I manage to have a brief talk with the director of the center. The officer, though, avoids all my questions. When I ask for permission to visit the sheds, the issue is skillfully evaded: “No problem. You will just need to obtain permission from the Minister for Internal Affairs. Leave me your contact details and I will personally deal with it”. Deadlines set, from three weeks to three months. I am just wasting my time. I am already at the door, ready to leave. The officer calls me back: “Anyway”, he says tidying the collar of his shirt, “the migrant flow is hugely decreasing. I already told some French colleagues of yours, a few days ago. We are reporting very few people passing, this year”. Pensive, I say goodbye and leave. The matter is becoming muddier than the waters of the Evros. A circle of twelve golden stars on a blue background. While crossing the border of Ipsala, one of the bridges over the river, from a distance the unmistakable flag of the European Union stands out. The cicadas have come to take possession of the air again. From the arch, the river finally reveals itself for what it is: a silent reservoir swelling with dark waters. Swirling spirals dot the banks on both sides. Seen from here, the dream called Europe resembles a nightmare. For a European citizen, crossing the border is a simple procedure, the mechanical performance of an endlessly repeatable gesture: being on this or that side of the river is a matter of choice. The Greek agent lazily rests his look on page 4 of the passport, checking if the face on the document is the same as mine. “Welcome to Greece ”. Suddenly, a trail of images shakes my thoughts: the faces of Naqeeb, Osama, Muslim, Abdal Halek, Ahmad, Latifi, Rahmatullah and many other muhajirins to whom I cannot give a name confusingly crowd in front of my eyes. I think of Mussa Khan, whose face I do not know yet, if only through a webcam. Men guilty only because they carry a passport different from mine. A sense of guilt accompanies me through customs. “Ef caristo” . I greet the policeman back. I am in Greece. “Early in the morning I see them pass right up front, out the window. Their clothes are still wet, their shoes muddy. They never talk to anybody. Like ghosts, they walk towards the small square and sit around the roundabout, until the police arrive on their jeep and take them away. Every day it is the same”. Kastanias, a small Greek village on the border. In these rural areas, life would always be the same if it were not for the continuous flow of migrants. It is Sunday morning. After spending the night along the banks of the river, I go in the only bar that is open. Milkshake and doughnut. A Greek-American woman in her 40s is sitting at the counter. “I came back from New York six years ago and I have worked here since. Every year, especially during this season, I have seen migrants arrive. But the phenomenon has turned striking since a few months ago”. I met Maria a few days ago in Istanbul. Her words echo in my mind: “It is the same traffickers who encourage migrants to turn themselves in to the police, after crossing the river”. Under instructions from the Kurdish guide, Mussa Khan must have done the same thing. Maybe he passed right here. I am tormented by the thought. 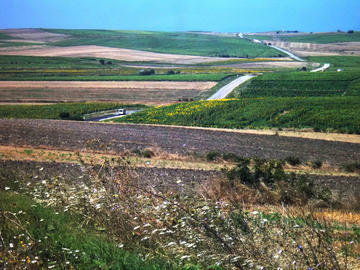 The South-bound road carries with it the features typical of a military infrastructure: at regular intervals, the flat horizon is interrupted by watchtowers, while army jeeps go along the area in both directions. The river is the silent, disturbing steady presence of the view. “You need to ask the authorization from the Minister for Internal Affairs. Only then will you have from us the answers you are looking for”. The police station in Orestiada, main Greek city along the river. In the late afternoon, Georgos Salamangas, commander of the station, sees me in his office on the second floor. Against my request for information on the migrants, he does not seem to be as flexible as his Turkish counterpart two days before. A wall of “no” stops any attempt at dialog. I put an end to this show and say goodbye hastily. A non-commissioned officer escorts me to the exit. He has witnessed the whole scene, in silence. “The flow in Greece is overwhelming”, he confesses, “and our resources are limited. This year we have broken all the records”. “But from the Turkish side”, I answer, “they depict a scenario that is the complete opposite, they say the phenomenon is decreasing”. A resigned look on his face. “The Turks are lying. They have no interest in stemming the flow. Indeed, they let the migrants pass through Greece so they hand the hot potato on to us. But”, he concludes, “the phenomenon cannot be denied. We are now intercepting over 200 people a day”. I leave, confused. In this war, it seems numbers are the most dangerous weapon. Numbers that no one wants to show publicly. A truck is pulled over by the side of the road. My gaze meets that of the young driver. “Thessaloniki?”, I ask on impulse. His hand gesture is a clear invitation. Only a second later I am sitting inside. “What is a reporter doing here?”, Orestis asks me after the introductions. “A report on migrants crossing the Evros”. “Oh, so you have come to tell the story of the mines”. The sentence catches me by surprise, but I manage to hide it. “Yes… why, do you know anything about it?”. He looks at me while entering the highway. A sign says “Thessaloniki 450 km”. Given the heavy load we are transporting, it is going to take at least eight hours. “I did my military service there in 2008, in philachio 7, near Nea Vissa. At night sometimes we could hear explosions coming from the fields”. I take out my pen and note pad. “Wait”, I tell him, “start from the beginning”.